Once again we’ve had a year where our little corner of the world has had what at least feels like an unfair amount of rain… ok that’s typical for British and Irish summers. But as we face into another wet and wild winter, we really should be planning to ensure that we can handle the resultant surface water, particularly where high capacity or heavy load-bearing drainage channels are required. No two projects are the same and at KPC we are well aware of the varying needs of our customers. It is for that reason that we offer a wide range of specialised channel drainage systems. After all… there is no one-size-fits-all where drainage requirements are concerned. One of the areas where KPC excels is in the supply of channel drainage systems. We have long partnered with Ulma to provide Channel Drainage to cope with everything from the lightweight “Self” range for small back garden applications all the way up to the heavy duty requirements of surface water management on airport runways and terminal aprons with our F200 and F300 Channel Drainage units. You can imagine the extra demands placed upon a channel drainage system in removing surface water from the great flat expanses that are found at airports. This kind of application is no great challenge for the likes of our F300 Channel Drainage units. They are manufactured in polymer concrete, available with overall heights between 300mm and 600mm and are suitable for cascaded type slope to collect rain water in 1 metre long units. 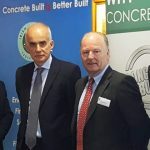 They feature a safe locking system consisting of eight bolts per linear metre as well as integrated galvanized steel edges for lateral protection. These units are designed and built to be used in demanding applications and when combined with an appropriately rated grating (such as an F900 grate) there’s not a lot that you can’t roll over them. But, beyond being tough enough for the loads that may pass over them they are also designed to transport large volumes of water quickly away from the area to be drained. 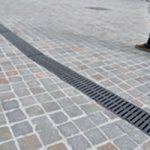 Of course, all projects need to be completed to a certain degree of quality finishing, so we stock a complete range of compatible channel drainage units with supporting units and accessories so that even the paved areas that are subject only to light pedestrian traffic can have the appropriate channel drainage units installed. 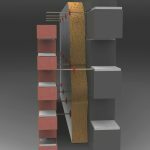 We have a “Brick slot” unit that is designed to integrate in the most aesthetically pleasing way to provide an efficiently drained pedestrian surface. Contact our team at Killeshal Precast to see how Channel Drainage systems from Killeshal can provide an efficient surface water clearance solution to suit your project specifications. Click here for our Channel Drainage products page.